Feeling lucky? 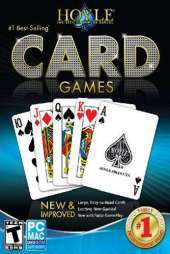 Then pull up a chair and deal yourself in to these exciting card games from HOYLE, the #1 brand in family entertainment. This features all of your favorite team-style and solo card games from Old Maid and Canasta to Solitaire and Poker. Learn new games and refine your strategy for hours of card flippin' fun, all in the company of the personable HOYLE characters. New AI characters and personalities. New shortcut keys for faster game play. Official Hoyle Rulebook & Strategy Guide included. Use HOYLE Face Creator to design your own player. Customize card backs, characters and more. Earn HOYLE rewards to unlock fun game bonuses. 5 new and exciting games. Large, easy-to-read playing cards and improved game logic.